We recently moved to Portland and one of my favorite things about our new house is the Juliette balcony off my daughter Parker’s room. Well, as long as there is no Romeo hanging out below it! LOL Sitting out there at night is so beautiful, twinkling stars for miles! This balcony and the romantic night sky view were the inspiration for the latest wedding I styled for Marry Me by Oriental Trading. 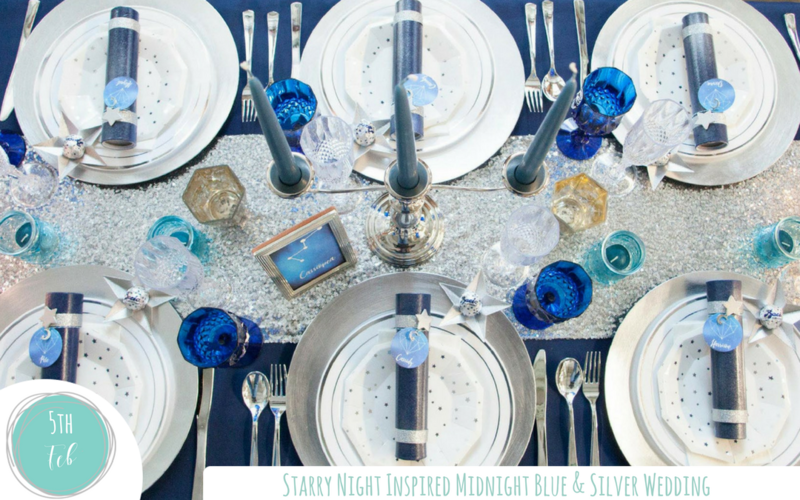 Midnight blue & silver capture all the magic of a starry night and make for an incredibly romantic celebration. Stargazers will love the geometric heart constellation incorporated into the printables by Elena of World Wide Party and cake by Confection Deception. You’ll find all the details to create your own with a midnight blue and silver wedding reception over on Fun365. Everything you need to See It, Shop It and Make. The reception decor for this midnight blue & silver wedding is full of beautiful yet cost-effective decor ideas. A DIY for Magical Starlight Centerpieces that replaces expensive floral arrangements. Place settings are decorated with a whimsical DIY Star Gazer Telescope Place Card. These quick & easy DIY place cards make for both a beautiful way of guiding guests to their seats and double as take-home favors. The watercolor backdrop I used at the reception is also incredibly cost-effective and the rich color combined with its size has real impact and accentuates the reception décor perfectly. I love having a bit of fun with a theme, for this one I created a Moon Pie Cocktail, a dreamy blue cocktail served with a mini-moon pie – head over to Fun365 for the delicious recipe! Get all the stunning details for this elegant, ultra-romantic and ultra-affordable Starry Night Inspired Wedding over at Fun365, you can see it, shop it and make it with the click of a button! I hope you enjoy all the DIY’s and ideas as much as I enjoy the balcony spot that inspired it.